Booker vs. Trump replaces Harris vs. Trump in the Election Graphs "five best-polled candidate matchups" group that we'll spend time talking about here on the blog. With these updates, the overall picture we have described here in previous posts remains the same. Biden is doing better against Trump than the other Democrats. 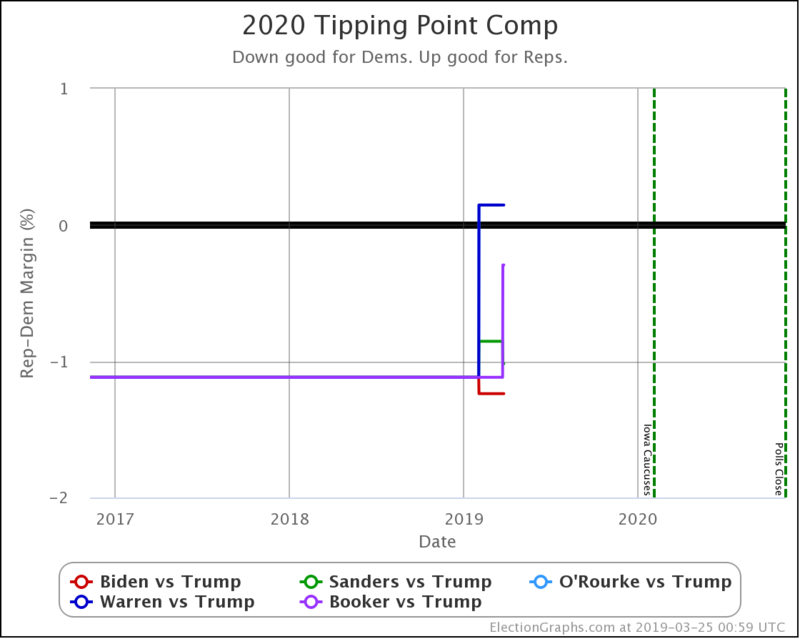 At the moment Biden leads Trump by 1.2% in the tipping point metric, Sanders leads by 1.0%, and Booker leads by 0.3%. Warren and O'Rourke both trail Trump by 0.1%. 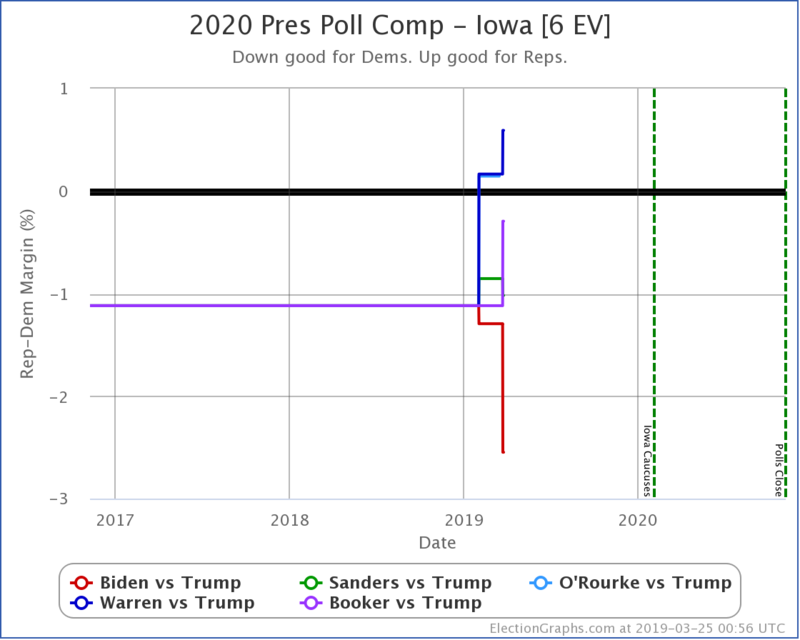 With this new poll, Biden's lead over Trump in the Election Graphs Iowa average increases from 1.2% and Sanders improves by 0.1%. Meanwhile, Warren falls further behind Trump by 0.4%, and Booker's lead drops by 0.8%. Emerson didn't poll O'Rourke this time, so no change there. Once again, as with the national picture, Biden does better than the other Democrats against Trump. It is important to note though that in both Iowa and the country as a whole, the numbers so far continue to show an exceptionally close race. 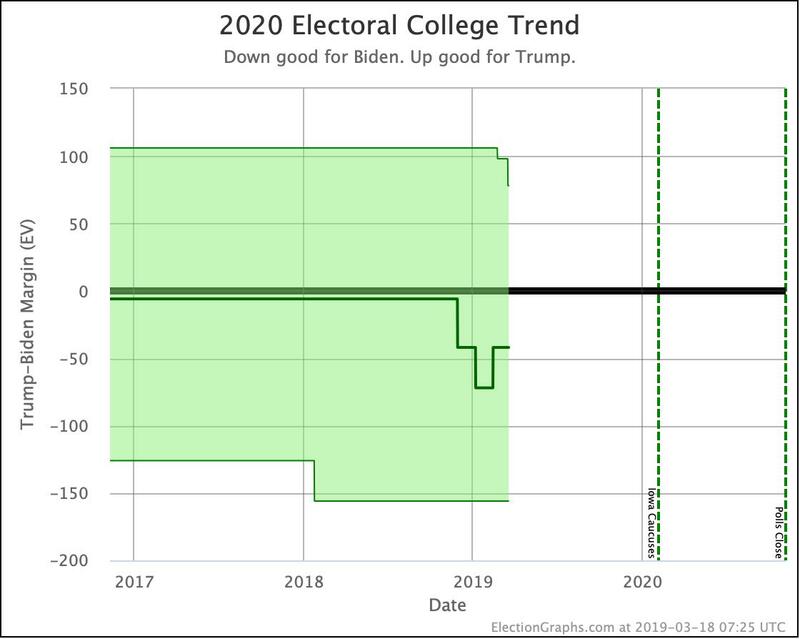 Biden's 1.2% tipping point lead is less than the 1.6% tipping point lead Clinton had on election day 2016. And we still have incredibly sparse data. Biden vs. Trump has the best polling, and even in that matchup only 9 out of 56 jurisdictions that determine electoral votes have been polled at all, and none have had more than three polls. So the Election Graphs numbers are still mostly based on prior election history rather than actual 2020 polling. But with the state polls so far, mirroring the primary polling we have seen, the theme, for now, is that Biden does best, followed by Sanders, with others trailing significantly. The Biden/Sanders advantage is likely still driven primarily by name recognition, but as the year progresses, that will be less and less of a factor. 589.9 days left until election day polls start to close.